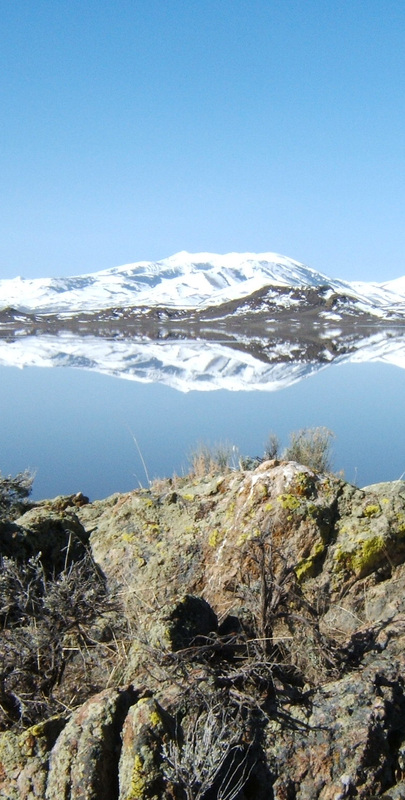 The countryside around Wild Horse Reservoir is a treeless high and cold desert. The flora and fauna are typical of the Great Basin. Big sage dominates the landscape with patches of quaking aspen trees in the hills. Sub-alpine habitat can be found in higher elevations. Late spring brings beautiful wild flowers backed by towering snow-capped peaks, many of which are more than 8,000 feet in elevation. Summer is a favorite time for many visitors. Daytime temperatures are moderate with cool nights. Although the park is open year round, winter can be harsh. Abundant snow and ice provide good recreation, but temperatures reaching -20˚F can be common and sometimes reach as low as -40˚F. Spring and fall are unpredictable with the threat of winter weather at any moment.